immeria: It's not a nightmare: it's a web page coded in Cobol! 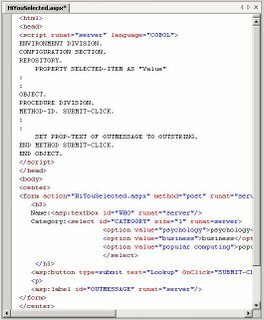 It's not a nightmare: it's a web page coded in Cobol! We have a big project where 20 years worth of Cobol on MVS/IDMS must be migrated to a Windows environment and Oracle. When I first heard about Cobol.Net I was surprised, but hey! .Net is language agnostic, so why not if it makes life easier. The approach involves Windows 2003 + .Net 1.1 + Fujitsu Cobol.Net 2.x + Visual Studio 2003. The target platform will be Windows Vista + .Net 2.x (or even 3.x) + Fujitsu Cobol.Net 3.x + Visual Studio 2005. Yep... a Web page with embeded server side Cobol! Ouch! See: Fujitsu NetCOBOL for .NET for further details.